It’s getting cold and dark outside which can only mean one thing: ski season. 1) don’t book too far ahead. Some people still book their ski holidays a year ahead to get the best value during the children’s holiday. This is especially relevant if you are coming from the UK or Netherlands when the distance makes planning more complicated. The trouble is, for years now, the snow in the alps has been unreliable. Before Christmas is very hit and miss, and after March is often slushy and brown. From Frankfurt, you can be in a good resort within 5-6 hours so be flexible and go where the snow is. 2) go by car. If you don’t have a car, rent one. Train will leave you restricted only to Switzerland easily, or a few big Austrian resorts. It will also take you all day to get there including changes. 3) booking last minute can be worrying, but if you aim for the less prestigious resorts but then go when they suddenly have snow, you will find booking.com always throws up a few well placed bargains. Of course, San Moritz and Klosters will always charge top dollar, so go for less known villages. In 10 years of doing this I always find something and often go twice or more a season. 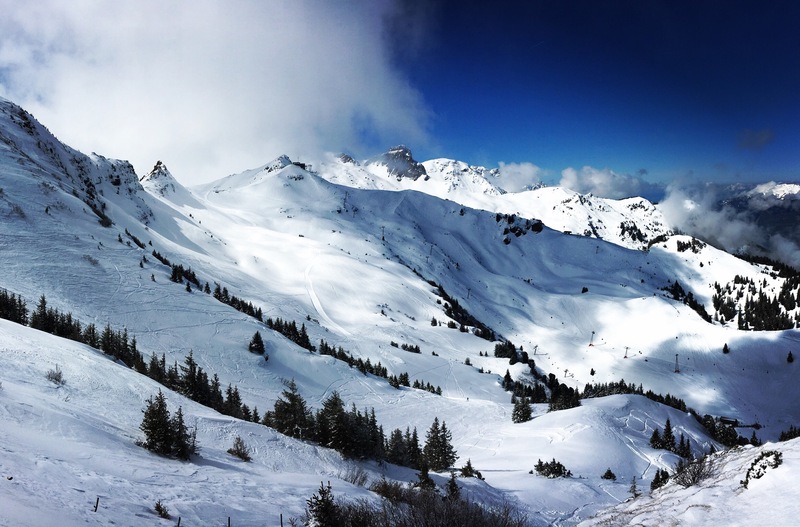 4) Switzerland maybe tempting for the stunning views and well-maintained resorts, but Austria will be a lot cheaper these days for food and drink and you will often find some really top class restaurants piste for good value. Also when driving to Switzerland, you have to buy the €50 road tax irrespective of how short you visit is. 5) take snowchains, practice putting them on in good weather and make sure you have winter tires. The mountain roads are extremely well cleared and gritted around resorts, especially in Switzerland, but sudden heavy snowfalls cause chaos on the road for unprepared drivers. Be one of the smart-looking people who coast past the abandoned cars on the mountainside! 6) hire skis for the season in Frankfurt. And definitely buy all of your ski gear here in advance. You will pay a premium in the mountain and you don’t want to waste a valuable first day queuing to get skis and boots. 7) get your winter sports insurance with the DAV (Deutsche Alpen Vereine) in Frankfurt. Not only do you get year round insurance for the mountain, you also get 50% discount off the climbing centre here in Frankfurt and many discounts on food and accommodation in mountain huts in the summer months. They also organise group trips in case you want to share planning and get to know other skiers.